Blinds — the most practical window decoration. There are many kinds of blinds, each option has advantages and disadvantages. 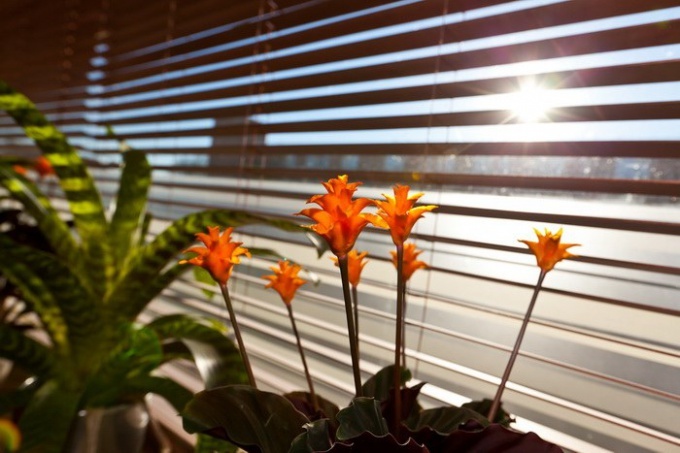 Due to the fact that the blinds are assembled from lamellae (individual strips of elements), they are easily breathable, and the modern protective structures by which they cover, prevent the collection of dirt and dust, which is very valuable for people prone to allergies. Currently, for the manufacture of blinds using a variety of materials — plastic, fabric, wood, metal. In some cases, these materials may be combined. Select blinds should be based on your preferences and the size of the budget allocated for their purchase. Fabric blinds — the most popular and budget option. Usually they are made of strong polyester, which has long do not fade in the sun and very easy to clean. To blinds for a long time retains its presentation, the polyester should be as dense. These blinds exist in large number of colors, so they can perfectly match to any interior. This option is good for home use. The rays of the sun filtering through the colored fabric slats, give the room an amazing decorative effect. More durable and expensive plastic blinds. They do not crumple, do not bend, keep their shape great. Better than plastic, which are made from slats, so it is more stable to temperature changes and sun light. Plastic can easily mimic wood, and can be used in combination with translucent fabrics. Plastic shutters are very easy to clean, unlike fabric, they do not accumulate static electricity, and absolutely do not miss the light. They are best used in work areas, as they provide wonderful protection from the glare of the computer screens or TVs. Wooden shutters are the most eco-friendly and durable. Unfortunately, that is why they are usually more expensive than other options. For their manufacturing are very light and durable wood species (balsa wood, a canadian lime and other), moreover they are treated with a special protective structure to provide durability. Special nail Polish prevents fading of the wood under direct sunlight. These blinds are best used in residential building, since they create extraordinary comfort in the rooms. Metal blinds - ideal for the office. They are made of aluminum or alloy of magnesium and aluminum and is covered with a special resistant paint. These blinds are not afraid of sunlight, do not absorb odors or grease and do not require any maintenance. Modern multifakturnye blinds are often used in complex decor of the room, because the combination of different materials allows to create an unusual style of composition. Such blinds are designed for designer layout to order and are extremely expensive. But with their help you can transform an apartment or a house.